This post is the concluding part of Custom ROM installation on HTC hero. Part one of this post presented Rooting, installing a recovery image, and backing up current ROM. In this we will be discussing how to install a Custom ROM onto your android and what things you must keep in mind while doing it and other prerequisites. At least 300-400 MB free space exists on your SD card. Since we are dealing with HTC smartphones here, we are required to do this step again. Because with latest update system re-flashes stock recovery and do not let us boot to the custom recovery image. And because of this users get errors like the 'Red triangle' with exclamation mark screen while booting, OR there mobile just freezes, OR screen is stuck and buttons stop working. so in order to get rid of these errors we just need to re-install the custom recovery image again. To do this follow the steps given under the heading '2. Installing Custom Recovery' in previous post and come here again after doing that. For installing Custom ROM, download the ROM file and copy it onto your SD card's root folder. It will be a zip file. 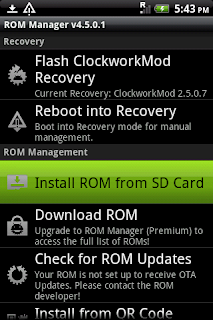 Now open ROM Manager and select the option 'Install ROM from SD Card'. It will then open your SD card and you'll get a list of all the folders on your SD card. Scroll to the bottom and find the name of your custom ROM and tap onto it. You will get an option window. Select 'Wipe Data and Cache' and 'Wipe Davlik Cache' and tap the OK button. Your phone will now restart (it will take some time and re-boot a couple of times), wait for a while and phone will boot up with the custom ROM you just used. That's it! Congratulations! You just flashed your Android device and installed a custom ROM on it! Please leave comments if you face any problems while working on this.